Mumbai: Gudi Padwa and Ugadi is a special day of celebration for many Indians today. The day is considered as the beginning of Hindu new year which is indeed an auspicious occasion for the people in India. This day is celebrated as Gudi Padwa in Maharashtra, Ugadi in Andhra Pradesh, Yugadi in Karnataka and the Kashmiri New Year is called as the Navreh. 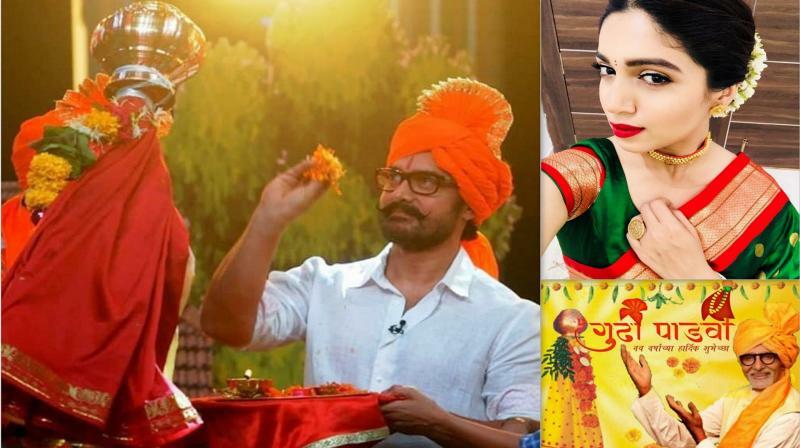 Hence, on this special day, many Bollywood celebs like Aamir Khan, Bhumi Pednekar, Sunny Deol, Saiyami Kher, Amruta Khanvilkar, Amitabh Bachchan and others wish their a Happy Gudi Padwa and Happy Ugadi. Wish you all a very happy Ugadi, GudiPadwa and Navratri !